Программа для создания систем помощи WinHelp (.hlp) и HTML Help (.chm) со всеми присущими такому рода программ функциями. Кроме создания систем помощи, возможна разработка веб-документации, а также экспорт созданной системы помощи в RFT-файл. Программа может интегрироваться в Delphi и C++ Builder, есть поддержка макросов. 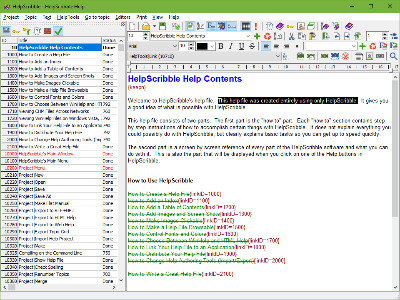 HelpScribble’s HelpContext property editor now supports Delphi 10.3 Rio and C++Builder 10.3 Rio. HelpScribble’s installer will automatically install it if it detects that you have Delphi 10.3 Rio or C++Builder 10.3 Rio installed. HelpScribble’s HelpContext property editor can assign HelpContext properties to controls in VCL applications and Multi-Device applications. The property editors for Delphi and C++Builder XE2 and later have been updated. They now retrieve component icons from the IDE to display the component tree. Property editors for Delphi and C++Builder XE and earlier versions (all the way to Delphi 1) are still included. Windows 10 no longer supports the WinHelp format. This has been noted in HelpScribble’s documentation since version Windows 10 was released. Now the Project|Make menu item shows a notice when you compile a WinHelp file on Windows 10, explaining that you’ll need an earlier version of Windows to view it and that you should switch to the HTML Help format if you need to support Windows 10.